PocketBook Touch Lux 3, the new premium e-reader with a screen of the latest E Ink Carta™ HD generation, which embodies all the modern traits for comfortable e-reading. PocketBook Touch Lux 3 – the new model of Touch Lux series and a successor of PocketBook Touch Lux 2, the e-reader which became a real bestseller with its wide functionality, reliability and excellent design concept rewarded by Red Dot Design Award 2014. PocketBook Touch Lux 3 retains all flagship e-reader’s traits, and has achieved an important enhancement – the latest E Ink Carta™ display with HD resolution (1024x758 pixels). 8GB of internal memory and a microSD memory cards slot (up to 32GB) will allow to keep with you several thousands of books, and a powerful 1 GHz CPU is completely enough for smooth pages turn and fast response of any application. 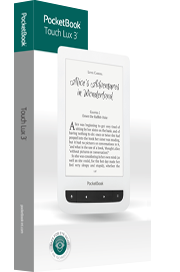 PocketBook Touch Lux 3 supports 18 book formats without converting and 4 graphic - JPEG, BMP, PNG, TIFF. 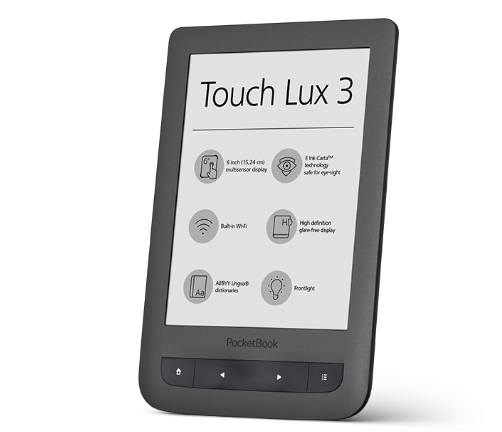 Reading with PocketBook Touch Lux 3 - is the time-tested tradition of quality and excellence of Touch Lux series now with E Ink Carta™ HD screen. According to the optical properties E Ink Carta™ HD screens are even closer to ordinary paper, due to a lighter background and more contrasting black color. The new technology enhances contrast by 50% to a value of 15:1 and reflective abilities by 20% compared to its predecessors. These figures make it possible to display text and graphics even more clear. Reading a smallest font text as well as watching the most sophisticated charts and graphs is now even more comfortable. PocketBook Touch Lux 3 e-reader is also equipped with LED frontlight that provides the feeling of maximum reading comfort in any light conditions. With in-built Wi-Fi module the device supports all on-line content delivery services, such as Dropbox, Send-to-PocketBook and PocketBook Sync. Pre-installed ReadRate application provides a unique opportunity to share the book preferences and receive book recommendations from friends. PocketBook Touch Lux 3, the new premium e-reader with a screen of the latest E Ink Carta™ HD generation, which embodies all the modern traits for comfortable e-reading. PocketBook Touch Lux 3 – the new model of Touch Lux series and a successor of PocketBook Touch Lux 2, the e-reader which became a real bestseller with its wide functionality, reliability and excellent design concept rewarded by Red Dot Design Award 2014. PocketBook Touch Lux 3 retains all flagship e-reader’s traits, and has achieved an important enhancement – the latest E Ink Carta™ display with HD resolution (1024x758 pixels).